VK Duque Rengel, ME Abendaño Ramírez, AV Velásquez Benavides (2017): “Analysis of communication factors influencing customer loyalty among university students”. Revista Latina de Comunicación Social, 72, pp. 751 to 764. For all types of organisations, having a portfolio of loyal customers has become the social, economic and brand foundation that allows them to remain standing in the changing and unstable environment currently faced by companies. Based on this scenario, and as part of a process of continuous improvement, this research aims to establish guidelines to build customer loyalty among Ecuador’s distance-learning undergraduate students, through strategies linked to the improvement of customer service and communication channels, which allow strengthening the sense of belonging of university students. This research is based on the case study of an Ecuadorian university. The relation between this institution and its heterogenous publics is based on the analysis of the opinions of undergraduate distance-learning students. The field work was carried out with a mixed approach that combined qualitative and quantitative data collection instruments (interviews and surveys, respectively), which allowed for the analysis of the stakeholders’ points of view and the drawing of strategic communication guidelines to build customer loyalty. University; students; loyalty; services; communication channels; institutional affiliation. 1. Introduction. 1.1. 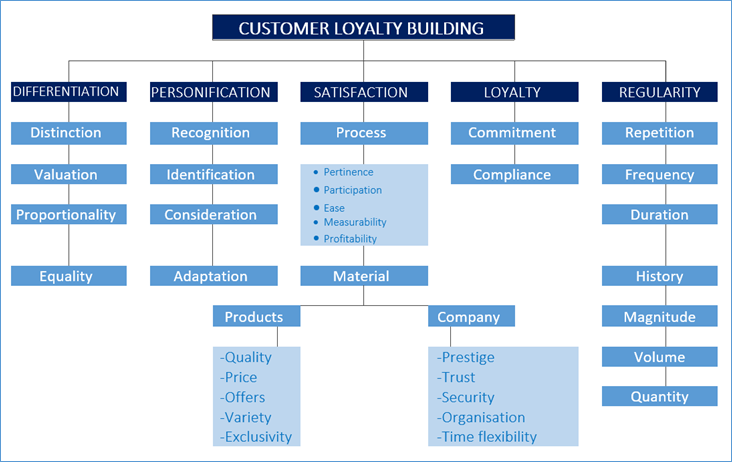 Fundamentals of customer loyalty building. 1.2. Loyalty matrix. 1.3. Customer loyalty indicators and categories. 1.4. Benefits of loyalty. 2. Methods. 2.1. Scope. 2.2. Techniques. 2.2.1. Direct observation. 2.2.2. Interview. 2.2.3. Survey. 3. Results and discussion. 4. Conclusions. 5. References. Higher education institutions have been created to respond to the needs of the communities in which they operate, and specifically to prepare individuals in different areas of knowledge, so that they can serve society as productive entities, with a high humanistic approach and a solid scientific-technical basis. This is why it is argued that: “the cultivation of science and the humanities takes place in another level of collective existence” (Revista EKOS, 2009: 126). Source: Buele, Ramón & Sánchez (2013: 38). According to various studies conducted in the last decade, student dropout is higher in distance education programmes, especially in the first years. The factors that have been identified as the causes of non-completion include: teaching methods, economic problems and lack of time to study. An example of this reality is shown in Figure 1, taken from the “Study of undergraduate non-completion rates and causes in distance learning programmes”, which found out that more than 50% of the student population abandon their studies in the initial stage. Faced with this scenario, customer loyalty can contribute to the decreasing of student dropout rates. Based on the previous premise, this research presents the case study of an Ecuadorian distance learning university that aims to identify the communication factors that influence the customer loyalty. Today, meeting the needs of customers is necessary to provide consumers with products and services that meet their expectations and desires, which is what builds loyalty. According to the Monterrey Institute of Technology and Higher Education (2011), loyalty includes the “actions carried out by a company to set up stable relationships with clients in the long term, to create in the customer a sense of belonging towards the organisation, and consequently generate positive conversations about it”. From this theoretical approach, customer loyalty, in the current context faced by organisations, can be turned into a sustainable competitive advantage for the company over the industry. Loyalty does not only imply retaining customers, but also turning these audiences into letters of introduction for potential customers, through recommendation. Thus, organisations of all kinds, as in the present case study, which belongs to the higher education field, should focus their efforts on achieving high levels of satisfaction in their customers, which is the basis for ensuring their loyalty. Therefore, the company should show its interest and commitment with its public. However, establishing links with stakeholders is one of the primary tasks of communication. To this end, communication management and business marketing should be directed at enhancing and optimising customer service, which consists in ensuring that stakeholders and consumers become loyal clients of the organisation. Emotions constitute one of the strategic tools to build customer loyalty. This is shown in the following Figure, which addresses the five aspects considered in loyalty building: differentiation, personification, satisfaction, loyalty and regularity, each of which integrates a series of actions to be achieved. Terrorists: Speak badly of the company because they are unsatisfied and the company has failed to establish relations with them. Mercenaries: Customers that are satisfied, but have not established ties with the company and will leave it if the competition makes a better offer. Hostages: Unsatisfied customers with whom the company has established relations. Apostles: Customers that praise and recommend the company because they are satisfied and have close ties that even create barriers against change. Placing university students in one of these categories is certainly necessary to determine their level of satisfaction with the educational service provided by the institution, and develop suitable strategies to make all kinds of publics to be identified as apostles. Loyalty that involves purchases from other brands at the same time. Disloyalty: limited purchases but with a positive attitude towards the product. Penetration: the number of customers who purchased the brand in a period of time, in comparison to the number of customers who bought the same product from other companies during the same period of time. Frequency: the number of times that a customer buys the brand compared with the number of times that a customer buys other brands during the same period of time. Exclusivity: The number of customers who purchased a brand compared to the number of customers who have purchased other brands in a period of time. Identifying these factors in the relationship between customer and organisation allows us to determine customers’ position and level of commitment to the organisation, as well as the current state and perception of the service offered by the company. They are promoters. Loyal customers tend to recommend the establishment so they become the best brand promoters. Continuous improvement. Loyal customers are familiar with the business and possess a higher level of trust so they are better able to make suggestions for improvement to the business. Better knowledge about customers for the company. The more a company reinforces relations with clients the more and better they get to known each other and the better the brand can adapt itself to clients’ needs and preferences. Creating a loop of continuous improvement. Profitability for the company. It is cheaper to retain a client than to capture a new one. These customers are also less sensitive to price hikes because they value the service that was given and therefore will be willing to pay more. Increase in sales: It is easier to sell a new product to a current customer than to a new client who does not know the brand. Furthermore, loyal customers are more likely to that demand new products or services from the company. Our study adopted a mixed research approach, i.e., it combined qualitative and quantitative techniques, to know the perception of diverse institutional aspects of the university under study and particularly of its distance learning study programmes. Quantitative data were obtained by means of the survey technique, based on closed questions of perception and weighting, applied to a research sample. The inductive and deductive methods, which go from the particular to the general and vice versa, were direct observation and documentary analysis, and subsequently to contrast the diagnosis of the situation and the final conclusions. The in-depth interview was also used to collect the opinions of the institution’s management team. The study adopts an exploratory and descriptive approach. It is exploratory because it seeks to establish and highlight the fundamental aspects of a given problem and find the appropriate procedures to correctly diagnose the current situation of the communication management and the actions to build customer loyalty. It is descriptive because it seeks to collect systematic, precise and objective data that will be used in the analysis and interpretation of results. These two approaches allowed for a clearer and more objective understanding of the subject matter, and provided the basis for the final proposed. This technique allowed us to carry out in-depth observation of the case study, and to establish a direct relationship between the object of study and the researcher, which facilitated the understanding of the context of study. Three in-depth interviews were conducted with the leaders of the teams directly linked to the customers of the distance learning study programmes. The survey encompassed three dimensions: customer service, communication channels, image perception and attributes. In the development of this research, we considered it was necessary to establish the reasons why students preferred the distance learning mode, because this is a determining factor for the potentialities of loyalty. More than half of the surveyed population, 55.69%, chose to study in distance-learning mode because their job did not leave enough spare time for on-site education. The second most common answer was people’s need to obtain a degree to grow professionally, with 11.89%. Most of the respondents who chose the variable “Other” specified that their time is limited because they have to take care of their family. This survey question evaluated the level of satisfaction of students in five aspects, in a 1-5 scale, obtaining an average of 3.28/5. In conclusion, the satisfaction level is over 50% but this does not mean that the evaluation of these aspects should not be improved. 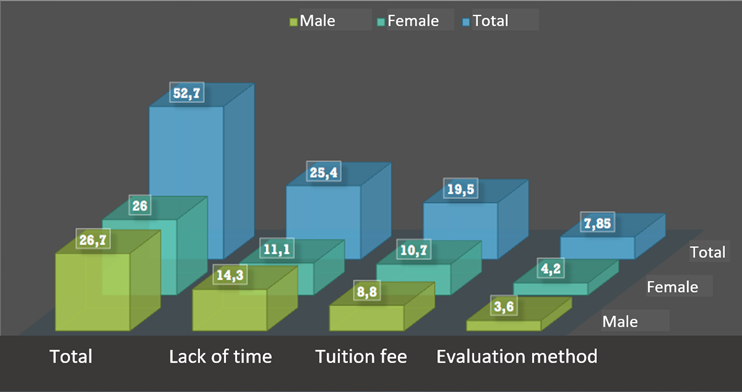 University support centres, with 43.31%, are the main channels used by students to carry out their academic procedures. Likewise, call centres and student services office, with 25.06% and 21.51%, respectively, the next most used channels among students. Email and social networks are the least used channels for administrative services, with 4.81% and 1.01%, respectively. With regards to the “other” channels, they were not specified by respondents. 61.51% of the student population obtains university-related news from the institutional website, which receives high acceptance. This communication channel is followed by social networks with 25.31 of acceptance. There is a low percentage of students who use the mobile app and the internal newsletters for information, with a rate of 4.75 and 3.79%, respectively, which indicates that these channels are not fulfilling the role for which they were created. For the purposes of this research, it was necessary to determine whether university students identified the attributes shown in Figure 8. As we can see, the attributes “leader in distance learning” and “academic excellence” stood out over the others. The profile of distance students is characterised for being people with family responsibilities and a job, mostly in private companies. Their age ranges from 17 to 68, being 17 to 21 years the dominant age-group. People in the latter age group are characterised for their aspiration to join the workplace early. The highest percentage of acceptance to the distance learning mode is geographically located in the mountain region. The academic model of the distance learning mode integrates student-centred elements, which are: professors and tutors, tutorial function, physical and digital resources and materials, and a technological platform. It is considered that the monitoring of students by teachers and tutors needs to be more rigorous and personalised. In recent years efforts have been made to make administrative services for students faster, more systematic and automated, so that students can carry out these processes online instead of going to a university campus. Institutionally, the main reasons for student non-completion are: economic problems, the difficulty to distribute time between school, family and work responsibilities, and limited basic academic knowledge when entering university. The university must create communication channels that are closer to distance students and strengthen and improve the effectiveness of the existing channels, taking into account the profile, requirements and needs of the students. Communication management currently focuses on the recruitment of new students, and the most commonly used strategies are mass communication and dissemination, relationship marketing and direct marketing. Loyalty building programmes for distance students must be implemented. The academic model of the university under study has a high percentage of acceptance by students. However, these audiences are slow to adapt to the model, and this variable becomes an important factor in student non-completion. In response, a loyalty building programme should aim to develop deeper induction courses to make sure the student has acquired an expertise in the model. This induction course should also include aspects related to the institutional identity and culture to create a sense of belonging from the first stage of the student life. Distance learning mode is characterised by a range of technological tools that are aimed at students, but are unknown, not used, and their benefits are not taken advantage of in the teaching-learning and communication processes. Thus, these tools should be more effectively socialised and disseminated. The majority of students who opt for distance learning mode are young (aged 18 to 27). However, there are several profiles within this population that respond to different realities. For this reason, it is pertinent to define these audiences and establish strategies to solve the needs of each profile. The level of satisfaction of distance students, our object of study, was evaluated in five areas (treatment, solutions tailored to customers, tuition fee/cost of service, administrative service and academic service), obtaining a satisfaction level of 66%, which indicates that some processes and services must be evaluated and improved, and that they must be consistent with the profile and needs of students. The basic actions of customer loyalty building are related to the attention customers receive. The values perceived about the organisation by customers constitutes a key element in business management. Since loyalty is a determining factor in customers’ abandonment of the company, universities must develop a programme to create a sense of belonging, according to each of the student profiles, through strategic and tactical actions that cover the areas related to the learning mode, including the communication and marketing area or department. The communication (informative) channels welcomed the most by distance students are: the website and social networks, and that is why this aspect must be used strategically to communicate the most relevant topics to students. In addition, the remaining channels should be enhanced. 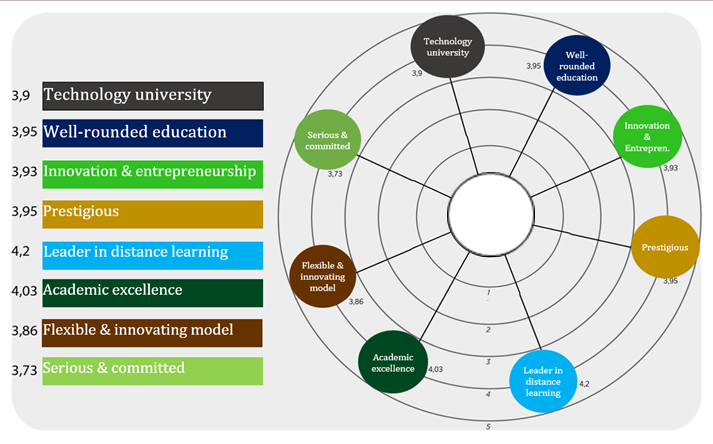 The image attributes of the University (prestigious, serious and committed, leader in distance education, technology university, academic excellence, flexible and innovative model, well-rounded education, innovation and entrepreneurship) are identified by students with a general average of 3.94/5, which equals to 78.8%. These figures indicate that the image positioning is quite acceptable, but has low influence when it comes to students droping out of school. Álvarez, A. (2011). Medición y Evaluación en Comunicación. España: Instituto de Investigación en Relaciones Públicas (IIRP). Capriotti, P. (1992). La Imagen de Empresa. Estrategia para una comunicación integrada. Barcelona, España: El Ateneo. Capriotti, P. (2013). Planificación estratégica de la imagen corporativa. (4° ed.). Málaga, España: Instituto de Investigación en Relaciones Públicas. Costa, J. (2005). Master DirCom: Los profesores tienen la palabra. La Paz – Bolivia: Joan Costa y Grupo Editorial Design. Costa, J. (2012): El DirCom de hoy: Dirección y Gestión de la Comunicación en la nueva economía. Barcelona: CPC Editor. Costa. J. (2015): El paradigma DirCom: El nuevo Mapa del Mundo de la Comunicación y el management estratégico global. Barcelona: Costa Punto Com Editor. Fuente, S. (2015): Módulo Comunicación de Marketing. Quito, Ecuador: Universidad de las Américas: Master DirCom. Instituto Tecnológico y de Estudios Superiores de Monterrey, Universidad Virtual. (2011): MK152-CRM (Customer Relationship Management) como estrategia de mercadotecnia. Diplomado en Mercadotecnia. México. Ménsen, V. (2011). Fidelización de clientes: concepto y perspectiva contable. Artículo, Costa Rica: Revista digital de la Escuela de Administración de Empresas del Tecnológico de Costa Rica. Muriel, M. & Rota. G. (1980). Comunicación Institucional: Enfoque Social de las Relaciones Públicas. Quito: Editora Andina. Ocampo, M. (2011). Comunicación Empresarial. Plan estratégico como herramienta gerencial y nuevos retos del comunicador en las organizaciones. Bogotá ECOE Ediciones. Reinares, P. & Ponzoa, J. (2004): Marketing Relacional: un nuevo enfoque para la seducción y fidelización del cliente. (2°. ed.). Madrid, España: Prentice Hall Financial Times. Ritter, M. (2012). Cultura Organizacional. Buenos Aires: La Crujía Ediciones. Ritter, M. (2013). El Valor del Capital Reputacional: por qué la opinión que el público tiene de su empresa es un activo estratégico. España: Ritter and Partners Comunicación Estratégica. Schnarch, A. (2011): Marketing de fidelización: Cómo obtener clientes satisfechos y leales, bajo una perspectiva latinoamericana. Bogotá: ECOE ediciones. Vahos, J. (2014). Imagen Corporativa: modelos de gestión. Antioquía: Editorial Universidad Pontificia Bolivariana. Varela, R. (2008). Innovación empresarial: arte y ciencia en la creación de empresas. Bogotá, Colombia: Pearson Educación de Colombia Cia. Ltda. Article received on 18 December 2016. Accepted on 25 June. Published on 30 June 2017.